Greetings! Forgive my lack of presence, the combined result of responsibilities to others and creeping decreptitude. :) I am inspired to post, however, because jan-u-wine has written a beautiful new poem in honor of the day, Nothing Is There Better. "Beautiful" is almost a limp descriptive of Nothing Is There Better, it is such a lovely piece. When I read it I seem to feel it, literally; I experience it through my senses, making the emotional impact the more powerful. The way Jan sets up her spare but perfect word-pictures does this, the clarity of observation, through Frodo's eyes, expressing the subtle depth of his new-yet-becoming-familar life on Tol Eressëa across the Sea. I think his healing, if obliquely stated, is greatly in evidence, as if there is a profound quiet inside Frodo, a contemplative quiet that seems only occasionally disturbed by the static of past pain and suffering. And Bilbo is still there, a heart of joy, if a very old and very frail one. I love this new poem with all my Tolkien-enraptured soul. The illustration is a picture Tolkien made while on holiday with his young family at Lyme Regis. They were there in 1927 and 1928. Tolkien did a lot of drawing and painting on these visits, much of it eventually informing future illustrations for his imaginative work. 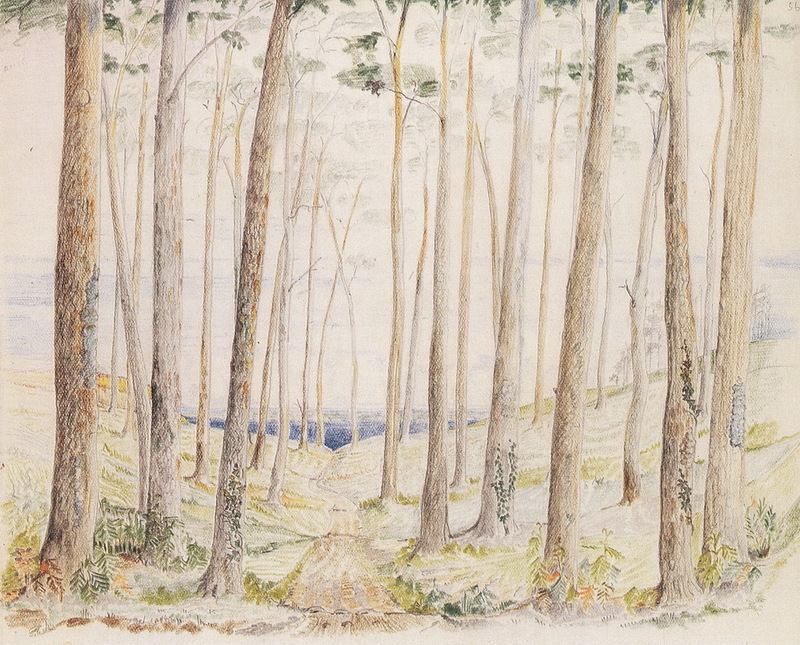 His study of trees along a path approaching a view of the sea, "Tumble Hill" (locally called "Timber Hill"), is a picture that contributed to illustrations of wooded scenes to come, the forest of Taur-na-fuin and the Vale of Sirion in Silmarillion, and Mirkwood and the Elven Kind's gate in The Hobbit. It seems like spring in "Tumble Hill", the leaves, high up, not fully out, the air clear and fresh, the shape and texture of the tree boles predominant. It was this picture that inspired Jan's poem. among the grasses of the ditch. when I return, still more than half a-dreme. with the wanting of Adventures. (as always mine have been). the roses waxy beneath a risen Moon. It is better than the company of the Road. It is our birth-day, kind and quiet and good. Lovely post as usual! This one may be one of Jan-u-wine's best poems yet!! :D The imagery is so vivid here - and the perspective of both Frodo and Bilbo! AH! Love it! It captures them so well! I've missed you! Much has transpired since your last post. I'm currently in league with a new Frodo lover who's even newer and younger than ME! Man, I thought I was the pup around here! XD It's great to know that the love of Frodo's being passed on at least to some degree. I also graduated college this past May. YAY! Greetings, Diem Kieu! Thank you for stopping in. I agree, this is one of Jan's very best. I will have to read your comment more fully later. I am at the moment at an airport trying to get home (since yesterday). Am I tired! hello, DK94! Yes, it has been a goodly long while and I'm happy to hear that you are more a Tolkien fan than ever. So glad that you've enjoyed this tribute to the wonderful Baggins Boyz! Ohhhhh, this leaves me speechless with gratitude and love. The two of you are a joining that brings so much imagery and vision and inspiration to me. Isn't it especially wonderful, Shirebound? I love it inexpressibly. :) Thanks for stopping in. I can't believe it's been a year since my last post! Such has been my Real Life. Sigh. thank you so much, Shirebound! I'm so grateful that Mechtild and I found each other. It's an honor to collaborate with her. 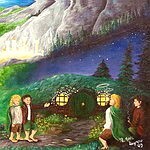 And an honor to write a tribute to the lovely Baggins boyz! Hear, hear! And welcome back! glad to *see* you, Ink Gypsy! Thank you both for a lovely post and a very moving poem. As Mechtild says in her introduction "I think his healing, if obliquely stated, is greatly in evidence"
Yes, the poem shows us a Frodo who has healed enough to see the beauty of nature all around him with clear eyes and a tranquil heart. It warms the heart of this reader, far away across the Sundering Sea. It's so good to see you both together again. Oh, I raise a glass in decrepit solidarity with you, Ms. Metchild. it's beautiful pic and fits well with is't sea eye beyond the trees. So good to see Frodo content at home with Bilbo, Jan--all the simple and grand treasures of nature everywhere by his doorstep being enough for Frodo, and a dream of a little more being right for Bilbo--both forms of happiness together. Perfect to see them this way on their birthday. Isn't this a beautiful piece? I see you "get it". Oh, this is lovely! Jan-u-wine paints a beautiful word picture that enables you to see the scenes very clearly in your mind's eye. It exudes a very gentle and restful presence. How are you? Long time no "see"! I hope your mother is doing well - she must be in her 90's now? Time just moves so fast. I'm a grandmother now, twice over. :) A 3-year-old boy and a 13-month old girl. It's wonderful! Re: It's great to see you! Isn't it a fine piece? Yes, when you read it you experience it. My mom is very frail and mostly unhappy, but happy when I come. She would love me to leave my home and family to come and live there and take care of her till she dies, but I just can't, or won't. I am so sorry for her, and love her, but I want and need my own life, home and family. It doesn't stop me being anxious over her all the time, though. Thank goodness our daughter is happy and well. I don't think I could survive worrying about her, too. We also watch over my husband's mother who will be 90 in November. But she is a much more cooperative person than my mom, much more extroverted and enjoys what she can of her life, in spite of the diminishments of old age, especially short term memory loss. Oh-my mother is 93. Nice to see you, Maewyn, virtually speaking! What a lovely and lovingly post, my dear. And thank you both for this great tribute. I'm more than grateful being part of this loving family! Here's to the Shire family! and to all Bagginses lovers! thank you, dear Julchen. So happy that you enjoyed! It is really, really nice to be *together* with a jewel amongst collaborators, Mz. Mechtild. here is to the Baggins lads and, more especially, the love they have engendered. A perfect match on their birth-day -- JRRT's Art, Jan's poem, and Mechtild's commentary, all fresh & sweet. I agree with M, the words of the poem put you instantly on that road (and later, in that kitchen nook), with Frodo & Bilbo. There is a line about the air being as sharp as the newborn rocks, and I know what that means... And oh how I miss that air, which happens here where I love perhaps 2 days out of 365 (in Alaska, it's daily, making one feel alive). As my own childhood memories fade, alarmingly. But this is life. And it's good. It's especially beautiful when enhanced by such lovely art & poetry. Mary, what a gorgeous comment. You have the eye, oh, yes, and the words. "As my own childhood memories fade, alarmingly. But this is life. And it's good. (...) It's especially beautiful when enhanced by such lovely art & poetry." How this resonates with me, Mary. Thanks so much for stopping in. It's a beautiful, knowing, loving piece and I'm glad you saw it. Oh, Mary, it means the world that you have read and commented (and enjoyed!). Thank you. I'm so sorry that your memories of childhood are fading. Lately, I've begun to think that (unlike the Elves), the sadnesses we endure as mortal people cause our memories to fade out of a sense of survival. CR! that is the 'top' of our hill....the little kitchen nook of this decade. We should make a date! I love that you love this, dear Mary. And I love you, too! Oh, Jan, your reply to dear Mary has made me weep.